Riddle me this…Puzzles and lifestyle in a pretty package. 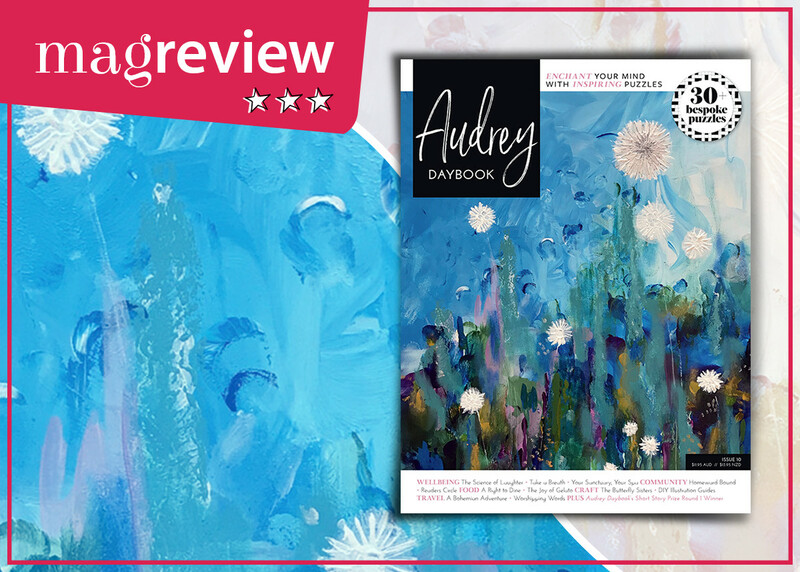 Who is Audrey and what is a daybook? She’s a new bi-monthly and is a unique blend of everything you never knew you wanted in a magazine. In a nutshell it is puzzles and wellness but take time to read the details because that doesn’t do its gorgeous pages any justice. Audrey is divided into 5 chapters, (Wellbeing, Community, Food, Craft and Travel) each reflecting the features within. The puzzles are scattered throughout, over 30 of them, so they’re no afterthought. You’ll find something no matter your mood or mental state – word searches, crosswords, anagrams, codebreakers and cryptograms. Audrey is a joy to leaf through. The beauty of the design is all part of the appeal. Clean and not crammed, everything is given room to breathe on the page. Illustrations and photos play an equal role in creating the stylish splendour on these pages. How do they get so much into an issue? Between puzzles and features there are also events, books, prizes, food, craft and colouring. Solutions to the puzzles can be found online, so after the satisfaction of finishing you don’t have to wait until the next issue to find out if you were right. Audrey is a slow read. You don’t binge on her before a dentist’s appointment. You take her with you wherever you go until the last feature has been read and the final puzzle solved. She’s a treat to be savoured.